Halfords Yuasa Racing set the pace as the 2016 Dunlop MSA British Touring Car Championship revved into life at Brands Hatch this weekend (2-3 April), taking a win for the Honda Civic Type R and leaving the Kent circuit atop the Drivers', Manufacturers' and Teams' tables. Gordon Shedden and Matt Neal were quick to underline the potential of the strikingly-liveried Civic Type R by qualifying second and third respectively for race one, with new recruit Andy Neate reacclimatising himself to the cut-and-thrust nature of the BTCC in 18th place on the record 32-strong grid. Shedden and Neal maintained their positions on a slightly damp track in the opening encounter, before going one better in Sunday's second outing to seal a commanding one-two finish. In the reversed grid finale, three-time champion Neal fought hard on soft tyres and significant ballast to cross the finish line fifth and assume the championship lead, whilst defending title-holder Shedden's hopes of a top ten finish were undone by a late puncture - although the Scot had nevertheless done enough to annex second spot in the early-season standings. Neate wound up 18th, 26th and 26th. "It's been a good weekend, with a couple of podiums including a win, a big points haul and Matt and myself sitting first and second in the Drivers' classification," remarked Shedden. "The Honda Civic Type R is clearly very fast, and there's still more to come from it as we are learning all the time. "We didn't take any risks in race one and perhaps went a little bit too soft on the set-up. I think my car was actually slightly better with the ballast on-board in race two, which wasn't at all what we had expected, and I got bullied a little bit in the early part of race three and then picked up the puncture. Still, no complaints - it's been a very strong weekend for us." "It's been a fantastic weekend and a cracking day today for the team," concurred Neal. 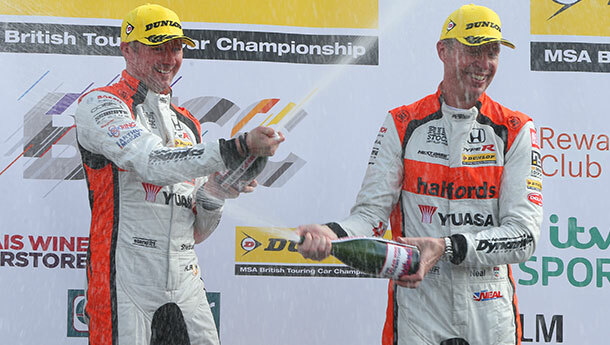 "What a way to welcome Halfords back to the fold and to repay Yuasa's loyal support. I'm over-the-moon â€“ dead chuffed. "We probably went a bit too safe with the car due to the conditions in race one, and race two got a bit sketchy at times; 'Flash' and I were settled in third and fourth when it all kicked off ahead of us between the two leaders, and then there was oil down on the track at Graham Hill Bend later on. We scored more solid points in race three, and to come away from Brands leading the championship is just the perfect start." "Brands Indy isn't the easiest place to return to racing, with such a short lap and so many cars in the field making for a very busy track!" reflected Neate. "The main objective coming into the weekend was to finish all three races damage-free, which we pretty much achieved. Rounds four, five and six of the 2016 BTCC campaign will take place at Donington Park on 16-17 April.